Are you in the market for the best alkaline water filter pitcher and considering the pH Replenish glass alkaline water pitcher by Invigorated Water? If you are, you’re in the right place. In this article, you’ll find out everything you need to know about the pH Replenish pitcher and if it’s worth the money. With all the new alkaline water products popping up, you can never be too careful before purchasing one. A lot of companies are making lofty claims for their products, but are they walking the walk or just talking the talk? For example, when a company claims to microcluster water molecules to make them easier for your body to absorb, you should be careful, which leads us into my review. What is the pH Replenish water pitcher? First, let’s take a look at what makes the pH Replenish different from other alkaline water filter pitchers. The primary difference is the Replenish is made of borosilicate glass while most other alkaline pitchers use BPA-free plastic or regular plastic reservoirs. The second difference is the Replenish filter. It uses filter bags within a metal mesh cylinder to turn ordinary tap water into alkaline water. The filter balls inside the filter bags contain tourmaline, activated alumina, calcium, zeolite, and several other ingredients. Now that you know what the pH Replenish is, let’s go over the features. You already know what’s in the filter, now let’s go over what happens to your tap water when it goes through the filtration process. Before I give my review of the pH Replenish pitcher, let’s see what current owners of the pitcher are saying about theirs. One person reported being happy to upgrade from a Brita pitcher to the pH Replenish. The owner likes using glass instead of plastic and recommended allowing the water to sit inside the pitcher for 3 to 5 minutes to allow the filter to work before drinking. Another person loves the taste, calling it “excellent” – reminiscent of the scent in the air after a fresh rain. One gentleman didn’t like the taste of the water produced by the Replenish. Another person called the water “clean and crisp.” She also likes how “straightforward” the pitcher is to use. Another guy is happy to be getting his minerals from the pitcher instead of supplementing with electrolytes. One promising review reported reversal of IBS symptoms. The same person now loves drinking water. The pH ON-THE-GO filter bags are sold in packs of 3. Each filter bag lasts quite a long time at 105 gallons. The easiest way to calculate how often you should replace your filters is to add up how much you and your family drink the first week. Once you get a total for the week, you’ll know exactly how often to replace the filter bags. Do alkaline water pitchers really work? I think they do, but it’s critical for us to temper our expectations before purchasing one. Yes, they produce cleaner water than what’s coming out of the tap, however, there are certain factors to keep in mind when reviewing some of the elevated claims made by the producers of the pitchers. The pH Replenish filter uses mineral balls to neutralize harmful substances in your water while adding back healthy alkaline minerals. The question I ask myself is where all the bad stuff goes during this process? In comparison, premium alkaline water machines use powerful filters that typically include activated carbon to scrub your source water of impurities before it goes through the ionization process. An alkaline water filter pitcher does raise the pH of your water, but you can’t control exactly how much it gets raised. Alkaline water machines don’t add minerals to your water. Instead, during the ionization process, acidic minerals are stripped from your water. It’s essential for us to get minerals every day. My concern is are we getting too much from the filter balls used in these pitchers? Personally, I wouldn’t choose the pH Replenish first if I were to invest in an alkaline water filter pitcher. I recommend checking out my review for the EHM Ultra Premium alkaline water pitcher. The EHM was certainly in the conversation for the best alkaline water pitcher in 2018 and uses a more powerful filter than the pH Replenish. As a second option, you can also check out my Hskyhan water pitcher review. Overall, I think the pH Replenish is a worthwhile alkaline water pitcher that produces crisp-tasting water according to current owners. If your tap water is fairly soft and clean, you should have a good experience with the pH Replenish. If your water is hard, you may want to invest in a more powerful alkaline water filter option. 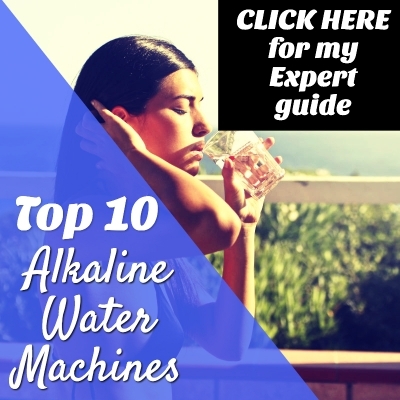 Alkaline water pitchers are good for getting your feet wet in the alkaline water world, and a definite step up from a Brita, but to reap all the truly amazing benefits of alkaline ionized water, you’ll want to upgrade to a premium alkaline water machine someday. There’s also new research showing the health benefits of both alkaline ionized water and molecular hydrogen-rich water. Several alkaline water machines I’ve reviewed here on my site make alkaline ionized water with molecular hydrogen. The beauty of a premium alkaline water machine is it’s built to last a lifetime and beyond. Click here to check out my top 10 ionizers buyer’s guide for more information. To read more about the pH Replenish glass pitcher and additional reviews, click here to go to the Amazon product page. Cheers to good health and longevity!